To download, save and print my Bridal Show Coupon in pdf form, Click Here! 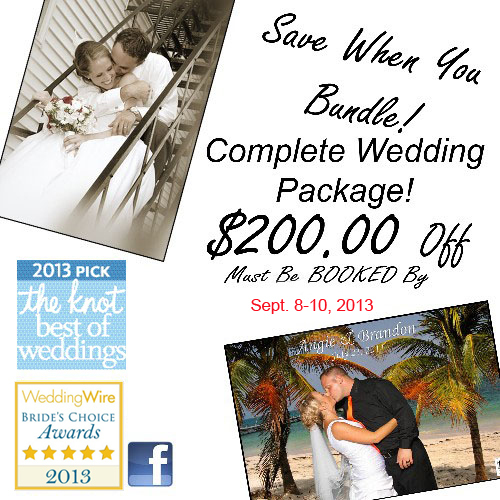 Special Discount exclusive to Bridal Show attendees! 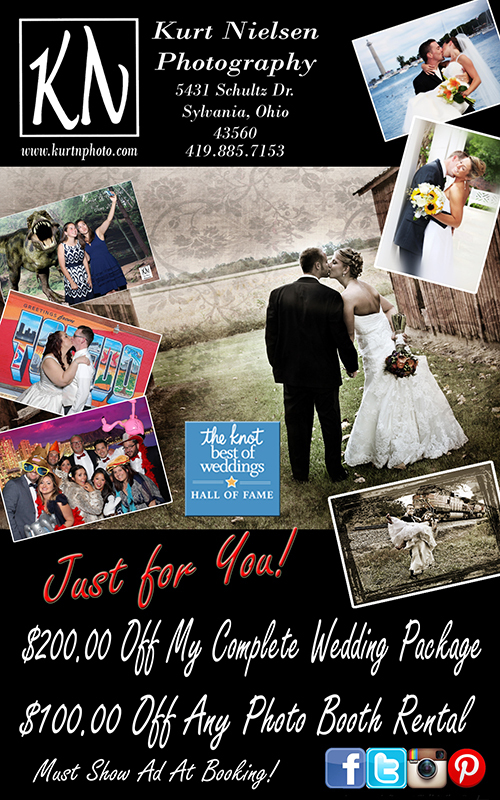 Save $200 on our Complete Wedding Package at Kurt Nielsen Photography! Kurt's Complete Wedding Package includes Full Coverage of your wedding and reception, including extra locations for wedding party and romantic pictures, complementary engagement photo session,a life long DVD montage set to music of all of your images, FREE online web hosting of all of your images for you and your friends to view, all of the images taken will be put on a beautiful jump drive and are printable and full resolution and you will get a print release to have them printed anywhere that you would like, Kurt's Kustom Keepsakes Green Screen Photo Booth for your entire reception, all photo booth images on a CD for you and uploaded online for FREE download for your guests, unlimited 4x6 prints of the photo booth images for your guests to take home (everyone in every picture gets a copy), and a Scrapbook of all of the photo booth images signed and decorated by your guests at your reception for you to take home that night! Save $100 on Kurt's Kustom Keepsakes Green Screen Photo Booth for your Wedding Reception. Our photo booth staff will arrive one hour before your reception starts to set up and will stay until the end of the reception. Our unlimited prints policy is that everyone in every photo gets a 4x6 print to take home! We are the ONLY photo booth in the area that does this! All images will be uploaded to our website within 24 hours for your guests to download for FREE. You will also be given a CD of all of the photo booth images. Scrapbook and other options are not included in this package. To take advantage of this special bridal show offer, you must show this coupon as seen in the Sweetheart Deals Coupon Book at the time of booking. ABSOLUTELY NO EXCEPTIONS! A non-refundable deposit is required to hold your wedding date when booking your wedding. Kurt requires a $400 deposit to hold your date. The deposit amount will be applied to your total amount due for the wedding package you choose and is not a discount off the package price. No wedding date can be held without a deposit and signed contract. This special offer is not valid with any other special offer, discount or coupon. Military discounts are available with any other wedding or photo booth package. Thank you for attending the The Toledo Area Bridal Shows for 2017! ! Add Kurt to your Address Book! Attending a bridal show can be very overwhelming to most brides to be. There will be so much going on from DJ's playing music, samples of wedding cakes and appetizers for you to taste, decorations and halls to check out, and so much more. If you are just starting to plan your dream wedding, plan to be here for the duration just to get through the entire venue. There will be hundreds of brides attending, so it's a good idea to show up early in order to get to see everything and to talk to everyone. This also gives you the opportunity to re-visit the vendors you really want to talk with in case you have more questions for them. Bring your mom, maid of honor, bridesmaids, your groom to be, and anyone else who will be helping you plan your wedding day. That way, they can see it all also and help you make some of the important decisions. It's also a good idea to make up address labels before you attend any bridal show. Make sure you include your name, address, phone number, email address and date of your wedding on these labels. Many of the vendors will have door prizes or contests and by having the labels made up before hand, will save you the time of filling out the information at their booths. Don't forget to bring a notebook and pen so you can write down anything you need to remember. Bringing a camera also helps because you can take pictures of decorating ideas, vendors booths so you can remember who you talked with, and anything else you saw at the bridal show. Make sure you check out all of the vendors at the bridal show in case you change your mind later about what you want for your wedding. Most of them will have handouts about their services and prices which you can check out and compare after you get home. Don't forget to bring your checkbook or credit cards. Most vendors, including Kurt, will offer special bridal show discounts for booking your wedding or scheduling your consultation that day. However, not all vendors will be able to accept credit cards at the show, so be prepared with your checkbook. Bring your calendar so you know when you are available to schedule your wedding consultations with the vendors you visit. It's also a good idea to know your wedding budget before going to the bridal show if you plan to book your vendors at the show. This way, you know exactly what you can afford to pay for each service. Probably the most important tip for attending a bridal show is to make sure you wear comfortable shoes and clothing. You can be walking or standing for hours talking with all of the vendors. Plus, it could be very hot and humid, or cold and rainy. Either way, be prepared for whatever mother nature brings that day. and find out what other brides are saying about Kurt Nielsen Photography! Click here to enter Kurt Nielsen Photography's full website!